Next: Apple Crisp! One more apple recipe before Christmas cookie baking! Previous: Bourbon Chocolate Pecan Bars! We are just one day away from Thanksgiving– one day hooray! Thank you to all of you who read my stories and enjoy my recipes & baking. I am forever thankful & grateful for each of you. In the past, I’ve written posts sporadically. Admittedly, whenever I could find the time to sit down, write for long enough to complete a post, and share it with you. But I want you to be able to count on recipes from me! So, going forward, I’m going to share (at least) one recipe a week. Weekly Wednesday Recipe with Rachel (WWRR). Hmm..It’s too bad there isn’t a day of the week that starts with R. I suppose we could call it a Weekly Wednesday Wecipe with Wachel…you know, in the words of Elmer Fud. Yes? Elmer Fud fans out there?? Anywho, I’m excited for this weekly share. And extra excited to hear your comments, feedback, and experience with the recipes! Perhaps you have pecan pie at your Thanksgiving table. Which is absolutely scrumptious. But how about a pecan pie with bourbon and chocolate. Mmmhmmmm! Before we begin, you should know that you can taste the bourbon in the pie. In other words, if you like bourbon, you will love it. 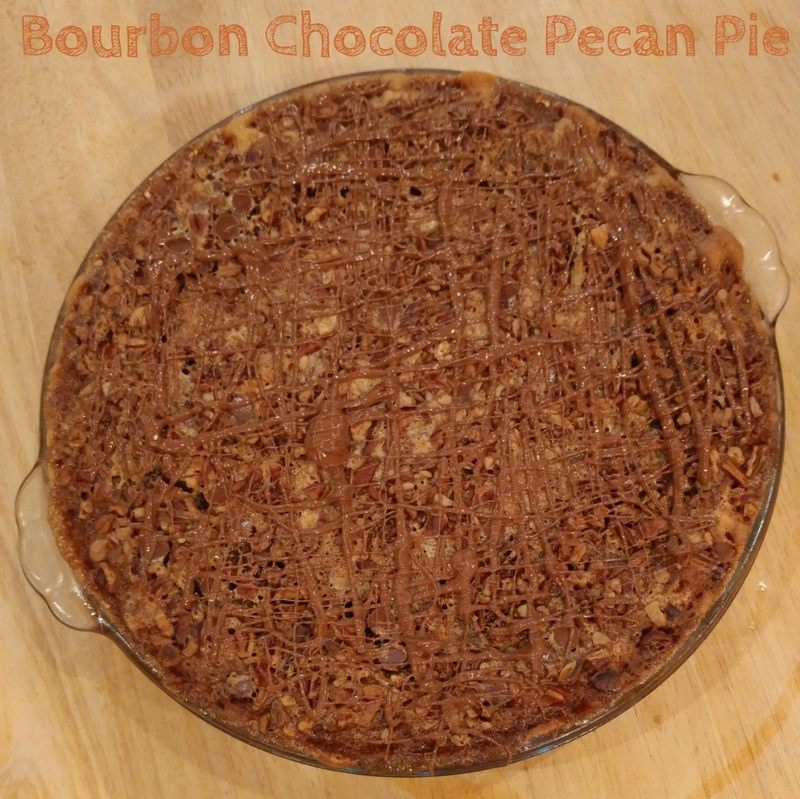 If you don’t like bourbon, just leave it out of the recipe below, and you’ll have a beautiful chocolate pecan pie! I’m all about the bourbon, so, let’s get to our boozy baking! 1) Preheat your oven to 350 degrees F. Spray a deep-dish 9-inch pie plate with non-stick cooking spray. If you’re using a pie plate that’s not deep-dish, that’s ok, but all of the filling might not fit (which is fine, just use what does fit). 2) In a large bowl, sift together the flour, corn starch, powdered sugar, and salt. Then, cut in the 2 sticks of butter. I use a pastry blender for this. You could also do it in a food processor or with two knives. Keep incorporating that butter until the mixture starts to stick together. It’ll form a dough. 3) Press the shortbread crust dough into your pie plate. I use my hands. If you don’t want to get your hands dirty, you can use the flat bottom of a cup– that works well too. Crimp the edges if you’d like to by pressing your finger from one hand between two knuckles on the other hand, with the dough in between. Bake the crust in the 350 degree oven for 20 minutes. 5) Once your arms are tired and the mixture is fully incorporated, your crust will probably be almost done! When it is, remove it from the oven. Turn the oven temp down to 325 degrees F.
6) Sprinkle about half of the chocolate chips over the crust. 7) Pour the egg-butter mixture over the chocolate chip studded crust. Then, sprinkle the pecans and remaining chocolate chips on top. Lightly press them into the custardy mixture to make sure they’re snugged in there. 8) Bake the pie in the 325 degree oven for about 1 hour. I put the pie on a baking sheet juuust in case there are any drips. You don’t want it dripping into your oven because the drips would burn and smoke and your pie would be ruined!! So, use the baking sheet. 9) It’s done when the whole thing is a beautiful golden brown color and the edges are bubbly. The middle will still jiggle. That’s ok. It’ll set when it cools. 10) Place the pie on a hot mit or wire cooling rack to cool. 11) While it’s cooling, melt about 1/2 a cup of your favorite chocolate in a bowl in the microwave. I use milk chocolate, but dark chocolate would also work well. Stir it every 30 seconds. It’ll probably only take about a minute to melt. When the chocolate is smooth, take a fork, dip it in the chocolate, and waive it back and forth over the pie in all directions. It’ll create a chocolaty drizzley topping. 12) The pie is easiest to cut when it’s cold; however, it’s unmatched when eaten warm. If you’re going for the look and want to be neat, cool the pie completely and refrigerate it for a few hours before cutting into it. OR, if you are OK with a gooey pie, you can serve it warm! I highly recommend putting a scoop of vanilla ice cream on top. Warm, chocolaty gooey bourbony pie with the crunch of the pecans, topped with the cool refreshing vanilla ice cream. It’s a match that’s meant to be. Happy Thanksgiving to you and yours from me and mine. Enjoy the holiday, savor lots of delicious food, celebrate the quality family time.